There is a lot of sound, a lot music, in Kate T. Williamson’s 2008 graphic novel At a Crossroads: Between a Rock and My Parents’ Place, but there are few if any actual sound effects. There are some “thump thump thump”s written into the panels during a brief anecdote about a squirrel infestation, and three little musical notes are rendered during a karaoke scene, where they could almost be mistaken for crumbs on the carpet. That’s about it. Yet despite the relative paucity of drawn sound, the book abounds with sound. It appears in the form of the sounds around her that she shares with the reader in keen descriptions that also reveal her state of mind. There are also numerous references to her favorite pop music, which serves as an emotional support structure. Williamson, in the context of this story, could certainly use some support. She’s back home, living with her parents, and trying to finish a book. 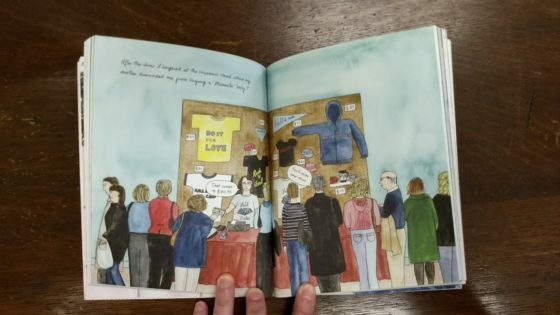 At a Crossroads is certainly a graphic novel, but it could easily be read as — mistaken for, considered — something other: a series of portraits and landscapes of suburban ennui rendered with captions and word balloons. The captions do tell a story, about a young woman dealing with Gen X dropout anxiety, and there are clear comic-book moments, multiple panels on a page or across pages that combine dialogue and figurative drawing. 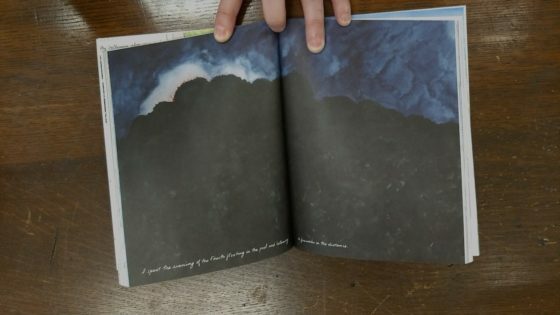 However, much of the book is comprised of extended, often silent or near-silent instances, like a two-page spread showing a house buried in snow, or another two-page spread of leaves on a few branches, or a New Jersey street scene depicted at night. Only the last of those examples features any text, a sentence or so at the bottom of the page in casual script. These spreads occasionally bring to mind the photographs of Duane Michals, who would write snatches of description onto his images, like scenes in a film — or, as it were, panels from a live-action comic. It’s tough to publish a book about the anxiety about publishing a book, because the whole time the reader is thinking, “Uh, I’ve got the book in my hands. And the publisher, Princeton Architectural Press, is pretty respectable.” This is the rare situation when the book itself is kind of a spoiler for the book. Still, Williamson’s analysis of her own heightened emotional state is handled solidly. The frequent appearances of pop music provide social filters (litmus tests for possible new friends), and acts of self-expression. One minute she’s doing karaoke, the next attending a Hall & Oates concert. It can be fun, and the presence of all the radio fodder is balanced by her meditative consideration of the near silence that exists around her most of the time. If the pop music is Williamson reflecting on her old self, the person she was when she previously lived with her parents, then the everyday noises are her consideration of loneliness, of her current, temporary, transitional state. She is caught, in other words, between pop and her sonic awareness of place. The book moves back and forth between those very different sonic terrains: packaged pop on the one hand and quotidian soundscapes on the other. It feels meaningful, as a result, that at the very end of At a Crossroads Williamson listens to the soundtrack to a movie, a Wim Wenders film, Paris Texas, whose score was composed by Ry Cooder. In other words, at the close of a memoir in which the narrator either pays attention to ephemeral background noise or focuses on highly crafted pop music, Williamson takes solace in recorded music intended to serve as background. 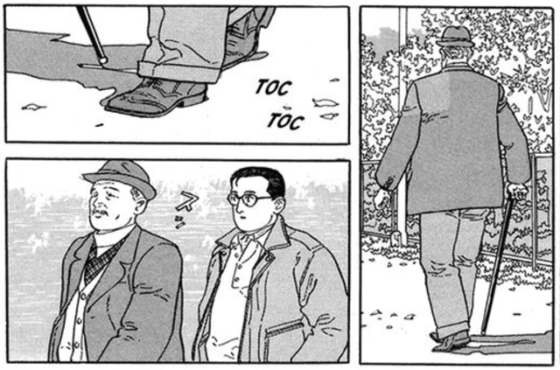 Take a stroll and describe it in sound, paying tribute to the late manga great Jiro Taniguchi. This project’s deadline is 11:59pm wherever you are on Monday, February 20, 2017. This project was posted in the late morning, California time, on Thursday, February 16, 2017. 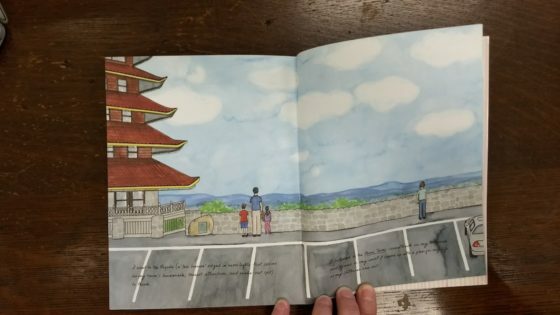 Step 1: This week’s project pays tribute to Jiro Taniguchi, the great Japanese manga creator whose numerous works include an adaptation of a Natsume SÅseki novel, dark crime stories, and a widely celebrated and largely dialog-free volume titled The Walking Man. The Walking Man in particular is the inspiration for this week’s Junto project. Taniguchi died on February 11, 2017, at the age of 69. Step 2: Take a leisurely stroll and record — whether through sound or observation, or both – what you see and experience. Step 3: Create a short piece of music that reflects the route and experiences of your walk in Step 2. Step 1: If you hosting platform allows for tags, be sure to include the project tag “disquiet0268” (no spaces) in the name of your track. If you’re posting on SoundCloud in particular, this is essential to my locating the tracks and creating a playlist of them. Deadline: This project’s deadline is 11:59pm wherever you are on Monday, February 20, 2017. This project was posted in the late morning, California time, on Thursday, February 16, 2017. Length: The length is up to you, depending on the approach you decide upon. Title/Tag: When posting your track, please include “disquiet0268” in the title of the track, and where applicable (on SoundCloud, for example) as a tag. Interpret as a graphic score an illustration drawn upon waking by Lark Pien. This project was posted in the morning, California time, on Thursday, September 22, 2016, with a deadline of 11:59pm wherever you are on Monday, September 26, 2016. Step 2: Record a short piece of music interpreting the illustration as a graphic score. Step 1: Per the instructions below, be sure to include the project tag “disquiet0247”(no spaces) in the name of your track. If you’re posting on SoundCloud in particular, this is essential to my locating the tracks and creating a playlist of them. Deadline: This project was posted in the morning, California time, on Thursday, September 22, 2016, with a deadline of 11:59pm wherever you are on Monday, September 26, 2016. Length: The length is up to you. Three minutes seems like a good length. Title/Tag: When posting your track, please include “disquiet0247”in the title of the track, and where applicable (on SoundCloud, for example) as a tag. This first appeared in the February 24, 2015, edition of the free Disquiet email newsletter: tinyletter.com/disquiet.